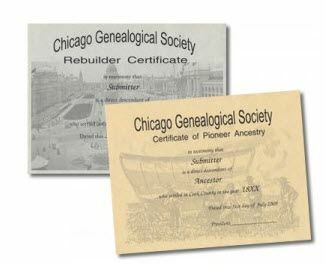 The Chicago Genealogical Society issues Ancestor Certificates to direct descendants of early residents of Chicago or Cook County. By documenting your ancestors, you are helping to preserve the records of your family and the history of the Chicago area. You will receive a certificate honoring your ancestors’ contribution to shaping the city of Chicago and its history. Additionally, the certificate information will eventually make it online at the Newberry Library’s ChicagoAncestors.org, an interactive genealogical and historical research tool. Applicants need not be residents of Chicago or Cook County nor even members of the Society. A certificate will be issued for each ancestor documented. For each certificate, complete the Application Form as fully as possible. Please use maiden names where applicable. If unsure of any dates or information, place a question mark after them. Submit proper documentation. You may include copies of census records, land records, birth/marriage/death records, church records, burial records (cemetery name and location), etc. as supporting documents. Please do not send the original documents! Family Group Sheets are not accepted as proper documentation. All applications and supporting documents become the property of the Chicago Genealogical Society. Consider including a short narrative of how your ancestor arrived in the Chicago area (by wagon, train, or water), their first residence, or their experiences during and after the Great Fire. We would love to publish it in our quarterly The Chicago Genealogist!